Your puppy deserves the best start and what better way to introduce your puppy to the big wide world than with a lovely designer puppy collar and lead set. We have sets made in the UK by top designers including Dogs and Horses, Mutts and Hounds and Scrufts. Choose between luxury leather puppy collar and leads or beautiful soft fabrics lined in luscious velvet. It will be a tough decision so take your time! 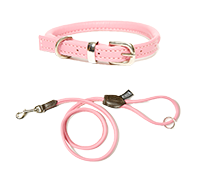 Let your pup strut in style with a new puppy collar and lead set. We have a fabulous selection of puppy collar and lead sets in both leather and fabric so we’re sure you’ll find one to match your playful pup perfectly. Almost all of our designer sets for puppies are handmade here in the UK by top British brands including Scrufts, Dogs and Horses and Mutts and Hounds. Make sure you complete your puppy’s new set with a matching designer puppy ID tag with free engraving and free delivery.